We’re in the middle of winter. As much as Seattle does not excessively cold, it feels comforting to drink hot beverages. We have plenty of teas, some with caffeine and others without, and most of the time we drink them plain. 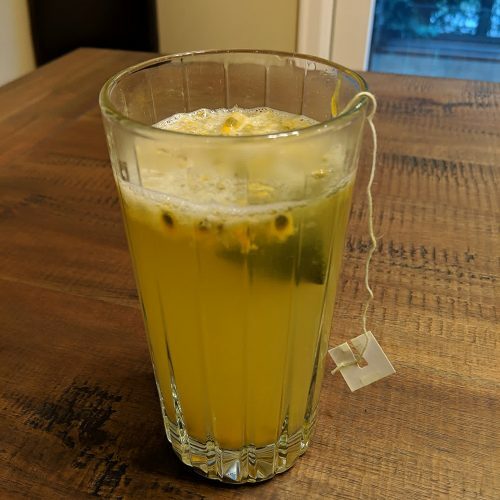 But sometimes, I feel like combining the citrusy flavor from lemon juice with Japanese green tea. 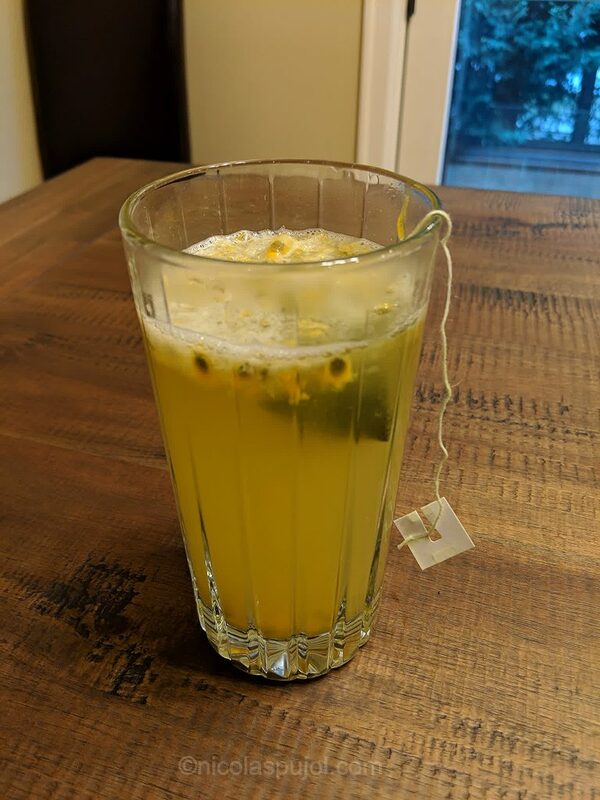 This hot lemon juice, green tea and passion fruit drink combines two sources of vitamin C, fruity acidity with the benefits of tea. Great coffee substitute. We tend to buy fresh passion fruits in large quantities from a farm, which ships them to our home. Since the shipping fee is fixed, it’s best to buy a full box of passion fruits and use them a lot for a few weeks. They are much more expensive by the unit at our local grocery store. So I am starting a passion fruit diet for the next few days. 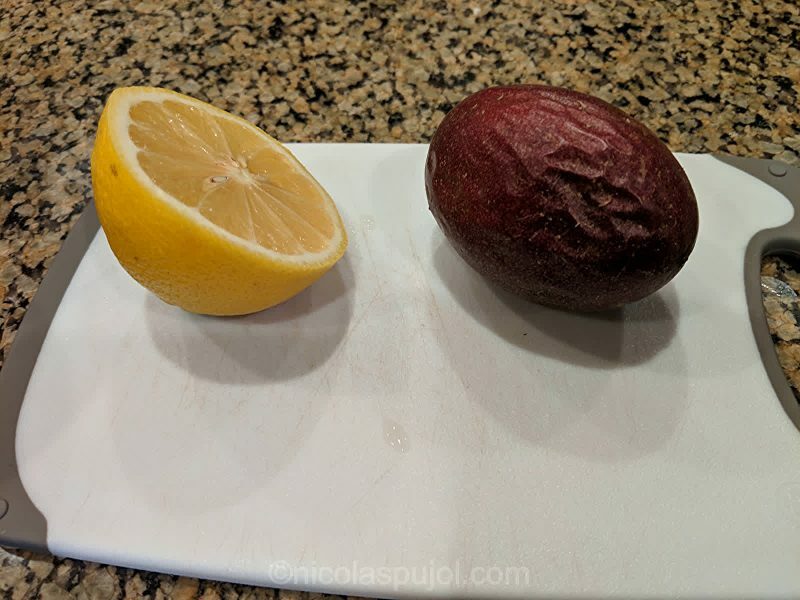 Passion fruits are both sweet and a little bit acid. I usually cut them open toward the top to avoid too much juice leaking out, then scoop all contents out into a glass or a bowl. I eat the seeds and thoroughly enjoy crunching and chewing through them. The vitamin C and light caffeine from green tea tend to a give a smooth boost in energy, which is a bit more sustained than coffee. It doesn’t tend to be coffee or this drink. It is rather, coffee early and mid morning, then a hot lemon juice, green tea and passion fruit drink later in the day. They complement one another very well. Cheers! 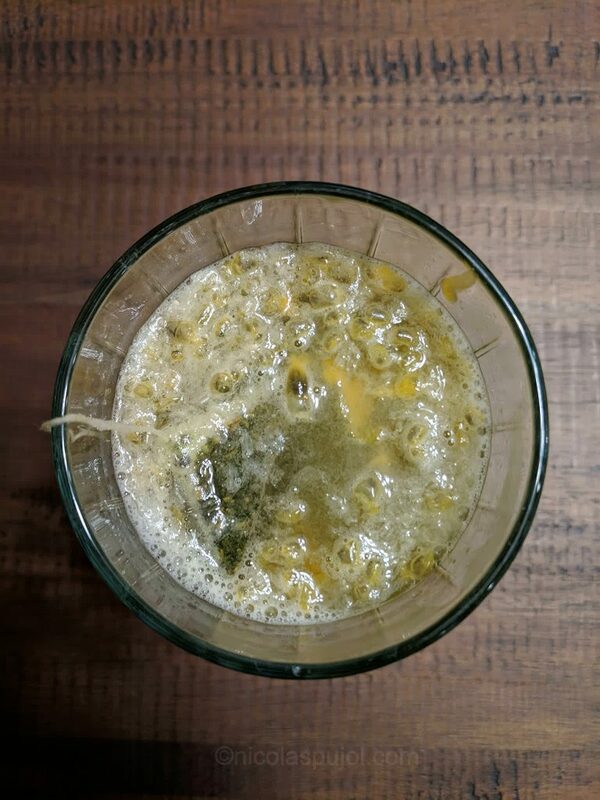 This hot lemon juice, green tea and passion fruit drink combines two sources of vitamin C, fruity acidity with the benefits of tea. Great coffee substitute. Fill a tall glass with water at 70% volume capacity. Heat in microwave 1 to 2 minutes depending on your oven, until water is near boiling temperature. Squeeze the lemon using a squeezer with a large liquid container. 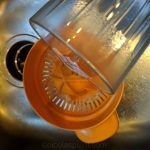 Run the hot water over the lemon pulp, into the container. Pour the juice back into the glass, then add the juice from the passion fruit. Keep or remove the seeds from the passion based on your preference.